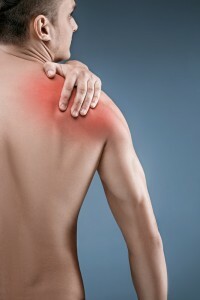 The shoulder is the most mobile joint and has a great range of motion as it is a ball and socket joint. It is however, shallower than the hip joint (also ball and socket) and this causes it to be more unstable. cavity of the scapula (shoulder blade). The muscles and other surrounding structures help to protect and stabilize the joint. Shoulder dislocation occurs when the head of the humerus is forced out of the shallow cavity (socket). Once a shoulder is dislocated, it makes it vulnerable to future episodes as the first episode of dislocation loosens the joint and makes it tend to slip out of the socket repeatedly. This is called chronic shoulder instability. Shoulder dislocation is common and is usually due to trauma such as road traffic accidents or contact sports (rugby, football, etcetera). Shoulder dislocation can be partial (the head of the upper arm is partially out of socket, called subluxation) or complete (the head of the upper arm is completely out of the socket). When the first episode of dislocation occurs, the surrounding structures such as the ligaments, tendons and muscles can be injured or damaged, reducing the stability of the shoulder joint and making it prone to repeated episodes of dislocation. Shoulder dislocation – as mentioned above, injury or trauma can be the cause of the first episode of shoulder dislocation. Once the surrounding structures are torn, it may lead to a feeling of instability and repeated dislocations. Repetitive strain – this means that the shoulder instability is caused by overuse which may be due to activities or sports that require repetitive overhead movement that stretches out the shoulder ligaments. This increases the looseness of the shoulder joint and causes it to be unstable, leading to recurrent dislocations. Multidirectional instability – In some patients, they are naturally prone to shoulder dislocations even without any history of trauma or repetitive use of the shoulder. In these patients, the shoulder is loose and can dislocate in many directions. This means that the head of the upper arm bone can dislocate towards the back, front, or bottom of the shoulder, hence the term multidirectional instability. These patients are born with naturally loose ligaments. Patients with chronic shoulder instability usually present with pain in the shoulder, repeated episodes of shoulder dislocation, feeling that the shoulder joint is loose and may feel like it may “pop” out, and having the constant sensation that the shoulder is slipping in and out. The diagnosis of chronic shoulder instability can be made with the help of the patient’s history and examination of the patient’s shoulder. Other tests that can be used are imaging tests, such as X-rays and magnetic resonance imaging (MRI) scan to rule out other causes of shoulder pain and to look for causes of shoulder instability. The treatment can be non-surgical (rehabilitation and oral painkillers) or surgical. Surgery is recommended for patients with more severe instability and rehabilitation is required after surgery. Dr. Adam Farber is one of the top shoulder surgeons in Phoenix AZ. He provides comprehensive nonoperative and operative treatments for all types of shoulder pain including instability. Should surgery become necessary, then Dr. Farber will perform it in a minimally invasive fashion. Most insurance is accepted, call Phoenix Shoulder and Knee today! Chronic Shoulder Instability. OrthoInfo. American Academy of Orthopaedic Surgeons. http://orthoinfo.aaos.org/topic.cfm?topic=a00529. Accessed 2/24/2017. Nepola JV, Newhouse KE. Recurrent shoulder dislocation. Iowa Orthopaedic Journal. 1993; 13:97-106.